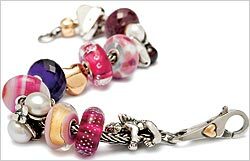 Trollbeads, the Copenhagen-based company, is considered to be one of the leading firms in the beaded jewelry business worldwide. But in the U.S. market, where it commenced business in 2003, the firm has been a laggard. Now, after assuming control of the U.S. operation from a licensed distributor, Lund Trading, in 2011 after a court battle, the company is repositioning itself in the U.S. with help from SAI, the Philadelphia-based shopper-focused communications and marketing strategist. According to Ada Yung, who joined Trollbeads USA as director of marketing last May, a big problem in the U.S. was that Lund didn’t devote much effort to creating a brand identity or developing a relationship with customers. Instead, it relied on the company’s network of retailers to do most of the marketing. “It was kind of limited,” she said. After joining the company last year, Yung set about looking for a “strategic partner” to help develop a branding and marketing makeover. She felt the company needed more strategic direction than the typical creative ad shop could deliver. After talking with SAI, she hired them to conduct market and consumer research. That initial project segued into ongoing project work, including a campaign focused on the weeks leading up to Valentine’s Day with more campaigns to follow. The strategy was very different from a year ago, when the company used its entire budget on magazines. This year, after brainstorming with SAI, and with essentially the same budget, a broader media mix -- including digital and social media -- was in play. The strategy shift also included broadening the target consumer to include younger professional women (under the age of 35) who are still establishing their personal sense of style “as it relates to fashion and design,” said Bill Melnick, director of strategic planning at SAI. Core to the digital part of the campaign was the application of behavioral and geotargeting to serve flash banners to targeted shoppers. The banners drove shoppers to online or mobile landing pages where they would find incentive offers and retail locators. There was also a Facebook tie-in, where the company has 50,000-plus fans. Facebook ads, pre-roll video and QR codes in magazine ads also supported the campaign. According to Yung, results were beyond expectations, with higher-than-average digital traffic and click-through rates, and with sales that exceeded projections by 150%. Next up is a Mother’s Day campaign and after that, the holiday season. Yung said she believes the results of the Valentine’s Day campaign portend “a breakthrough year” in 2012 for brand awareness, consumer connectedness and sales. “We’re showing up where our consumers are,” she said.